Have you ever wondered why GFCI outlet requirements exist? This article explains how National Electrical Code (NEC) regulations are in place so GFCIs can save lives. Ground-fault circuit-interrupters (GFCI) are devices found on outlets, circuit breakers, extension cords and other electrical equipment. They detect imbalances in electrical current, quickly shutting off power to minimize the risk of shock and electrical fires. In a home, for example, GFCIs constantly monitor electricity flowing in a circuit to sense any loss of current. If the current flowing through the circuit differs from what returns home (even if that current varies as little as 5 milliamps), the GFCI switches off power to that circuit in the blink of an eye – within 1/40th of a second. Receptacle: This is used in place of the average outlet found throughout an average house. It fits into a standard outlet box, protecting you from ground faults whenever something is plugged in. Circuit breaker: This GFCI type can be installed in a panel box to protect selected circuits. Not only will it shut off electricity in the event of a ground fault, but it will trip when a short circuit or overload occurs. Portable: If permanent GFCIs are not practical in a certain application, portable GFCIs are often a better option. Where are GFCIs often used? These are places where moisture exists, and where electrical shock could be a factor. GFCIs should be tested after installation and once a month to make sure they’re working properly. 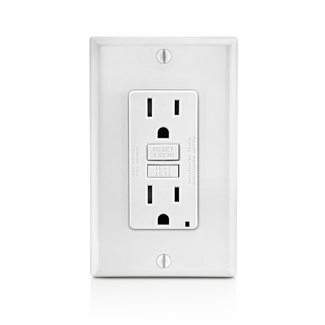 For a test, plug a lamp into the outlet and press the “TEST” button on the GFCI. The GFCI’s “RESET” button should pop out, cutting power and causing the light to turn off. If the “RESET” button doesn’t pop out, the GFCI is defective and should be replaced. Additionally, GFCI’s could protect you from lawsuits. If someone gets shocked at your home, it’s possible they could sue. Older homes often don’t have these safety devices installed, and it’s estimated 200 people a year experience electrical shock as a result. Border States helps veterans through Blue Angels FoundationHappy Thanksgiving to all!